I was in Christchurch for an all-day workshop on Saturday. The closest all-day parking was in the Art Gallery carpark. I resisted the idea of parking there. I never liked basement carparks, even before the 2010-2011 earthquakes, and I like them even less now. Stupid, I thought. Time to get over this fear. Thousands of people park in multi-storey and basement carparks every day in this city. I can do it for one day. I dove into the carpark, leapt out of my car, and practically sprinted to the exit. I was dismayed to find the pedestrian exit was through a couple of doors, down a corridor, and up a flight of stairs. 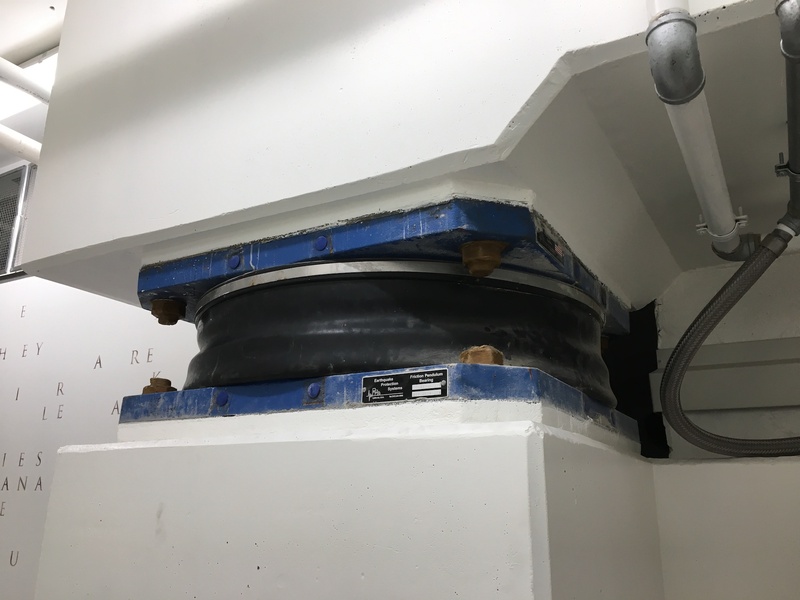 But just as I was about to climb the stairs, I noticed one of the seismic base isolators the building is equipped with. The geek in me overrode the scaredy cat, and I had to stop to snap a photo. These isolation units are a cool piece of technology. They essentially decouple the building from the ground, so that when the earth shakes, the building stays still. In a quake, the top and bottom plates of the unit slide contrary to one another—the building’s inertia keeps the top plate relatively still while the lower plate jiggles around. The isolation units were retrofitted to the art gallery (along with lots of other repairs) after the 2010-2011 earthquakes. According to the manufacturer’s website, the Triple Pendulum Bearings like those installed in the Art Gallery are designed to dampen the wide range of lateral vibrations from small, medium, and large quakes. They don’t make the building completely quake-proof, but they did make me more comfortable leaving my car there for the day.